A Welsh girl in Australia: Birki bargains! Do you like my Winter shoes? I took this photo by accident whilst playing around with my phone. These shoes make me smile...they are so different to anything else that I own. 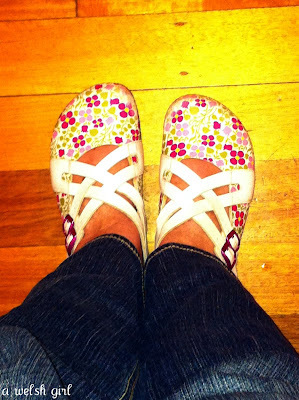 They were bought on a complete whim,/a spur of the moment/ a 'what the heck' impulse buy! and I also have a bit of a thing for a bargain and sometimes these two things combine! Apart from when in work shoes, most of the time my feet spend their time in open shoes. When I moved to Australia, I quickly wore out my summer shoes as I was wearing them for about 10 months a year as opposed to 10 weeks a year back in the UK! You can buy direct from Germany and save lots of $$$. I needed to spend just a little bit more...so these found their way into the virtual basket. I now own...well, let's just say quite a few pairs of shoes courtesy of this website. Awesome - i also get mine from there with friends. those are so cute. I have been meaning to post to tell you how much I enjoy your blog - we visit Cardiff whenever we are back in UK (hubby is English / I am American and we live here in Brisbane) and actually planned our NYC wedding while holed up in a B&B in Wales for 3 (rainy)days. a convert : ) ! Thanks for sharing the website. I'm a bit of a Birkie fan myself owning 3 pairs - but honestly can you have too many?! wow- beth i live in mine!! i have bought three pairs since moving here as they are so much cheaper than OZ!!!! oooh yes i do love your shoes! !